world-record conversion efficiency in a thin and lightweight form, making it ideal for a wide variety of applications. 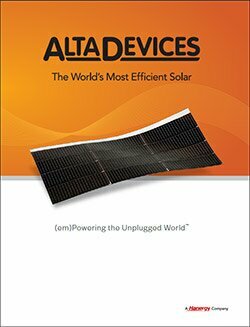 Learn how Alta Devices is (em)Powering the unplugged World™. Learn about how AnyLight mobile power technology uses solar power to increase battery life with minimal design impact. 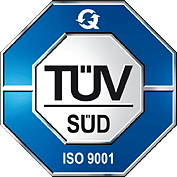 This brochure also provides information on configurations and specifications. Battery recharging on mobile devices and in other mobile applications is one of the biggest challenges today. 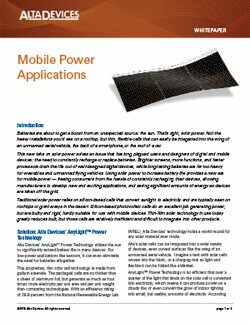 This white paper introduces a thin-film solar technology that not only extends battery life for mobile devices, but because of its flexibility, can be integrated into UAVs, automobiles, Internet of Things devices, wearables or many other mobile applications.